Created on Monday, March 13, 2006, 15:36:43 and categorized as Technical. Ever dreamt of a skip key on your radio? Or ever dreamt of a radio that just plays your favorite tunes? You have thousands of MP3s but just cannot find the one that fits your current mood? Being given that in many cases your best music comes from a CD you have borrowed from a friend of yours who suggested it to you, the Music Genome Project upscales this social network of suggestions in order to fulfill these dreams. In January 2000, a group of musicians and technicians founded the project with the ambitious goal to "capture the essence of music at the fundamental level". Therefore the people involved in the project created more than 400 attributes to characterize a song, like melody, harmony, instrumentation, rhythm, vocals, lyrics etc. Each song is analyzed for about 20 to 30 minutes to extract the little details that make it individual. Afterwards the song gets integrated into the social network of related songs. By now, this is nothing special yet as automatized music analysis called "Music Data Mining" is a relatively old field of research. The idea becomes vital when human interaction is added. This can be done by tagging semantic information to each song. Tagging is one of the Web 2.0's key ingredients. The internet's biggest site for tagged music is musicbrainz.org. The Music Genome Project combines the two technologies of man-made tags and computer-generated song relationships. Each user of the project's data can suggest his favorite tracks to be added to the database. In addition to that, each user can also rate the songs and therewith weaken or strengthen each song's position in the relationship network. The more users contribute to this system, the more representative becomes the song's positioning in the network. 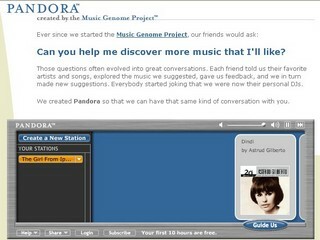 Pandora is a Flash-based player application that provides an interactive interface to the Music Genome database. You can trigger your trip into the database by typing a song or band name in the input form and then browse the network, be it interactively by rating, skipping and bookmarking, or be it in a web radio style by just leaning back and enjoying music you never might have heard of before. I just wished they had an API. According to an interview with the project's founder Tim Westergren (French) there are plans to offer one in future. I am looking forward to it.